I know.. I know.. it a bit late for a merdeka wish but, hey.. we still have 16 Sept to celebrate kan? Hehe..
And that didn’t mean Artventure Kid’s Studio pun lepak jer.. a week before merdeka we had this simple puzzle to commemorate the Merdeka day. Using foam, we just cut 14 red and white lines, a blue rectangle and a yellow crescent and star. 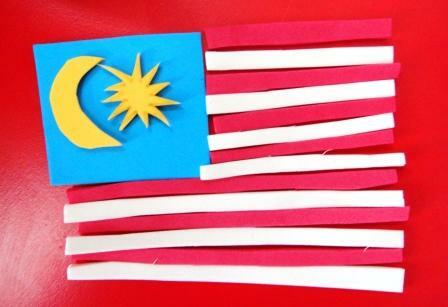 Posted on September 5, 2011 by artventurekids	• This entry was posted in Foam craft, Puzzle and tagged alor setar, art class for kids, art class in alor setar, art project for kids, kelas seni dan kraf untuk kanak-kanak, kraftangan kanak-kanak, project seni untuk kanak-kanak, puzzle diy. Bookmark the permalink.